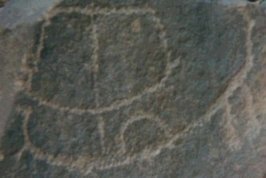 The earliest historic record of seafaring ships that can be found seem to be the Neolithic petroglyphs or rock art that are found in the Egyptian eastern desert. Many of these patterns have been dated to the Naqada period of Egyptian history which covers approximately the period of 4500-3100 BCE. Modern research is currently being done to obtain datable materials found in conjunction with the petroglyphs to more firmly establish the dating of when the images were made..
Current dates on many sites have been derived by comparative analysis with images found on artifacts and grave goods that are dateable by carbon fourteen analysis. However more conclusive dating of when these artifacts were created is yet to be made. Early interest in the culture that produced the petroglyphs was generated by England's archeologist Flinders Petrie in 1920. Petrie created one of the earliest archeological surveys of Egypt and did extensive work in Naqada. While exploring Egypt Petrie was also instrumental in establishing one of the first historic chronologies to help organize the evidence of his findings. The spirit of his efforts established Petrie as a true pioneer in the science of modern archeology and Egyptology. 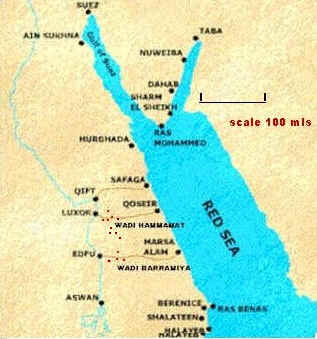 The Eastern desert of Egypt holds some of the earliest surviving evidence of mans seafaring activities. The pictorial record of these activities was recorded permanently for posterity in the form of beautifully rendered petroglyphs of various types of ships. These pictures made as rock art are spread throughout the Eastern Egyptian desert on the rocks and walls of the Wadis between the Nile river valley and the coast of the Red Sea. Many of these petroglyphs recreate images that are common to other artifacts from the Naqada and prehistoric phases of Egyptian Civilization. Grave goods from the Naqada periods reflect the same Iconography that are found in the pertoglyphs this phenomena has lead archeologists to conclude many of these images can be dated to the Naqada period of Egyptian Prehistory which runs from 4500-3100 BCE. The petroglyphs and their images are silent witness to the central role that ships and shipping had on the prehistoric Nile River Culture. The Nile when traveled by boat and ship is a natural highway that runs the length of Egypt and Sudan. Understanding the impact of the river on the lives and culture of this region is central to understanding ancient NileValley cultures. Within the Ships of Antiquity there is provided a chronological study of artifacts from antiquity that specifically carry ship motifs. The collection covers the period of 4500-100 BCE. The progression of ship technologies in antiquity can be seen and traced from the chronological arrangement and study of these images. It is apparent by comparing the Abydos boat burials which can be carbon dated to 3000 BCE that the motifs of many of these pertoglyphs predate the Abydos boat burials. The motifs within the petroglyphs suggest that the Nile valley may have been visited by distant cultures for trade or that the Nile Valley culture was sending regular expeditions to other cultures. There are artifacts that contain records of Mesopotamian motifs suggesting that travel by seas to a from the Persian Gulf and Euphrates river occurred on a regular basis. The exploratory imperative bringing contacts with distant cultures to the Nile Valley is suggested by the pointing leader motif. The reason for these contacts may have included, trade for metals, access to the interior of Africa via boat and a leisurely trip down the Nile to the delta and Mediterranean while having the advantage of provisioning their ships along the way. The motifs within the Petroglyphs and their location along ancient trading routes both suggest the scenario that contact with Mesopotamia occurred along seafaring routes on a regular basis. Because there are no written records that correspond to the time in which the petroglyphs were created we are left with interpolation and interpretation of the artifacts themselves as the primary means for drawing our conclusions. For those of us who love the art of spin the interpretation of these artifacts is prime territory for creative analysis. What is needed for the exact dating of the pertoglyphs will be additional archeology of eastern desert sites specifically related to the petroglyphs and the use of dateable materials recovered at these sites for analysis. However comparative analysis and interpolation from my personal studies indicates the dating will be to as early as 4500 BCE. If, as some archeologists have suggested, there are burials associated with the Petros, finding an undisturbed burial at a petro site would yield datable artifacts in a time capsule form. Creating such a find or finds seems to have a lot of potential for clearing up some of the prehistory associated with this phase of ancient seafaring. An early survey of petroglyph sites at Kanais in the Wadi Abbad were taken by Arthur Weigall in 1907 and then by Hans Winkler in 1936. Wadi Barramiya sites were originally discovered by Walter Resch in 1967 and later recorded by Gerald Fuchs between 1985 and 1990. A more current survey which is adding additional site locations is being taken by The "Followers of Horus" which is an archeological team organized by Dr. David Rohl and Dr. Toby Wilkinsen. What can be discerned from the examination and an analysis of the petroglyphs and related artifacts about the early Bronze Age Egyptian Culture?? Naqada II Period Pot with ship and flamingo motifs. with Wadi Mia and Wadi Kanais pointing figures. Similar daggers to this with finely carved handles can be found elsewhere, but the scenes depicted here are unique. On one side there is a battle scene on land and water; the other side depicts animals such as lions, ibexes and dogs. On the Back side at the top, above the knob, a man in the robes of a Sumerian priest-king is restraining two rampant lions. The motifs on this piece raises questions about contacts with Mesopotamia. The animal trainer motif being Mesopotamian in its origin. 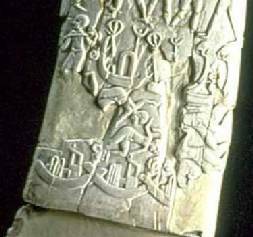 It could depict a battle between Nile Valley communities whose differences can be seen in the design of their boats, however it may also be an indicator that Mesopotamian traders were visiting the Nile valley at this time in History. What is certain is that it is an early example of Egyptian bas-relief and it is carved with great mastery. The silex is an example of expert flint napping with a polished blade on one side earmarked by thin parallel groves; the handle is covered with carving at its most refined, and characteristic of this period of Egyptian civilization. General location of the known Eastern desert Petroglyphs. 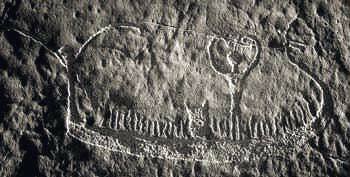 Surveys of the Rock art show they are generally distributed along routes that were used for trade. It can be concluded the survey has yet to find all sites and that their is much to be discovered in conjunction with the Petroglyphs.